Their leader is not in Ukraine. Former Georgian President Mikheil Saakashvili's supporters are holding yet another rally, demanding an impeachment of Ukrainian President Petro Poroshenko. The event began at about midday in central Kyiv. It was slightly delayed because several central subway stations were closed because of a bomb alert. Saakashvili is not in Ukraine. He was expelled to Poland under the readmission arrangements last week. "He is close to us in Europe, we will hear him today," one of the leaders of Saakashvili's Movement of New Forces, Ivan Slobodyanyk, said. 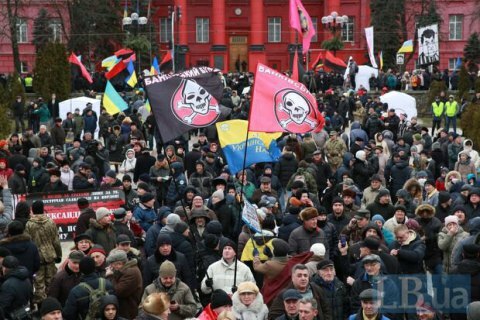 Rallies are also expected to be held in a number of other cities in Ukraine. The previous rally by Saakashvii's force took place on 4 February.